Used or New? What's best for your business? During my career I’ve supplied 100’s of new and used injection moulding machines. Determining what is best for your business depends on many factors but essentially the main considerations should be specification and up time requirements. Let’s look at both sides and the safe way to get a bargain ………..
Why do people buy used/refurbished? What are the negatives of buying used/refurbished? What are the positives of buying used/refurbished? What are the positives of buying new machines? Working with the OEM you can order the machine with a specification best suited to your required production. New machines should be well supported with spare parts. Uptime is usually higher with newer machines although brand new models can be troublesome. What are the negatives of buying new machines? Brand new models can be troublesome and check spare parts are already available. So if you decide to buy used or refurbished what should you look out for? Ensure the manufacturer (OEM) is a recognised, established brand with good UK support. Ensure the model you are looking to purchase is still supported with spare parts. This is especially important for electronic components as many go obsolete or they may cost more than you paid for the machine. Check the approximate market value by using our online valuation calculator or call us for guidance. See the machine moulding components. Check the platens are closing squarely (toggle wear). Check the screw is holding a consistent melt cushion and that the plasticising time is consistent. This will help establish screw and/or tip wear. Is the pump noisy? This will be an expensive replacement. Get a survey done. Contact the UK OEM as many will offer this. Ask the UK OEM for a history report – you don’t want to buy other people’s problems. Do an Asset HPI Check – Our partner GB Asset offers this as a free service to PlastikCity users. Contact Richard Briggs on 01564 771591 or email at richard@gbfinance.net and just quote our name. Good used machines are often available and there are excellent UK machinery dealers such as D&M Machinery and STV who can supply refurbished, tested machines with warranty. PlastikCity is a broker that can sell your machine or find you one for your needs. We are also happy to advise if you aren’t sure of your requirements. 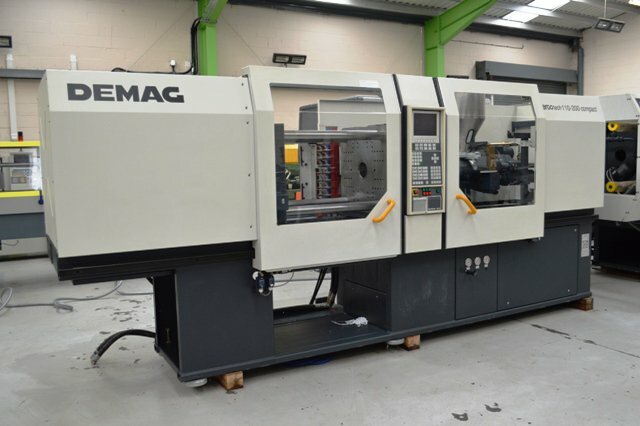 You can view our listings here where we have over 40 used or refurbished injection moulding machines. If you wish to sell your machine you can place the advert here where it is free to make your listing and you only pay a small commission if we find you a buyer. You can also sell or buy used ancillaries, mould tools, extruders, robots, spare parts and surplus polymer. Visit here to see the categories.